Peycho Kanev is a LibraryThing Author, an author who lists their personal library on LibraryThing. See Peycho Kanev's author page. About mePeycho Kanev has been writing poetry for the past 10 years. His poems have appeared in more than 400 literary magazines, such as: Poetry Quarterly, Welter, The Shine Journal, Ann Arbor Review, Walnut Literary Review, Midwest Literary Review, Chiron Review, Third Wednesday, Burnt Bridge, Istanbul Literary Review, 322 Review, Mad Swirl, In Posse Review, Southern Ocean Review, The Houston Literary Review, The 13th Warrior Review, Mascara Literary Review, The Mayo Review, Windmills, The Aroostook Review and many others. He is nominated for the Pushcart Award and lives in Chicago. His collaborative collection “r”, containing poetry by him and Felino Soriano, as well as photography from Duane Locke and Edward Wells II was published in the spring of 2009 by Please Press. Also in 2009 his short story collection “Walking Through Walls” (Ciela), and in April 2010 his poetry collection “American Notebooks” (Ciela) both were published in Bulgaria. 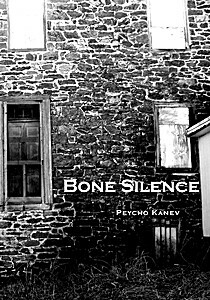 His new poetry collection “Bone Silence” was released in September 2010 by Desperanto, NY.